Collectible Handblown Glass Recycled Purple Wine Goblets, "Grape Blossoms"
Poised graciously on transparent stems, deep grape wine glasses host floral patterns. The set of four is handcrafted by Javier and Efrén, using glass-blowing techniques perfected over more than thirty years. The delicate motifs are etched by hand. Each (4): 9" H x 3.5" Diam. 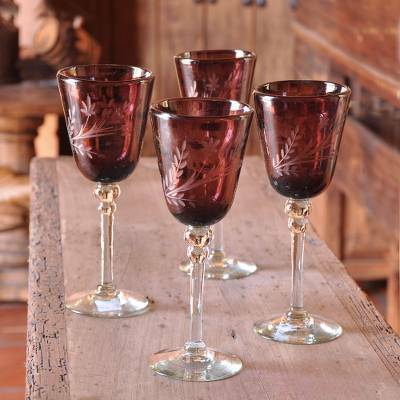 You can find etched wine glasses 'Grape Blossoms' (set of 4) by Javier and Efren in tableware categories such as Eco-Friendly Drinkware, Handblown Drinkware, Hollywood Glam Drinkware, Glass Drinkware, Cocktail Glasses Drinkware and Wine Glasses Drinkware. Enjoy exploring these sections for other Novica treasures.